Perak FA kicked off their Malaysian Super League campaign on a rather decent note, gaining two wins, a draw and two losses from their first five outings. The Seladangs got off to a morale-boosting start, as they completed a late 1-0 victory over Peter Butler’s T-Team FC in Lumut. After that, Azraai Khor brought his troops to face moneybags Johor Darul Takzim in Larkin. The game was dominated by the home side and the Seladangs got two men sent off just before half time for bad tackles. However, Perak fought hard to stay in the game, and while they did ultimately lose 0-1 to Johor, the grit and determination shown were inspiring enough for the fans. Next, they faced Felda United at home. Although the Seladangs were solid in defense their attacking department was a big let-down. The absence of key players like S. Chanturu and Karim Rouani was affecting them as they struggled to finish off key chances in the final third of the field. Similarly, the game against Felda was pretty even but the Settlers were much more clinical upfront and they ended up snatching a 1-0 victory against the Seladangs. Notwithstanding that Azraai Khor still has faith in his side’s capabilities, as he took them to Seremban to take on Negeri Sembilan at the Tunku Abdul Rahman Stadium on Saturday, January 19. This was a special occasion for Azraai as he had coached Negeri for two years and only parted company with them last year. However, it was business as usual and the boys delivered. Failee Ghazali struck in the 94th minute to give Perak a dramatic last-gasp win over the Deers, taking them to six points from their first four games. On the back of that morale-boosting win, Perak returned home to face traditional rivals Selangor FA just three days later. The Red Giants were brimming with confidence after beating league leaders Pahang just days before and were looking to take down the Seladangs as well. But contrary to expectation, it was Perak who dominated proceedings early on, as they constantly pressured Selangor with a wide array of passing arsenal. Selangor did take the lead through Francis Forkey Doe in the second half though, but Perak rallied back to restore parity through Abdul Hadi Yahya’s penalty. The game finished 1-1. Had it not been for several refereeing mishaps, the result could have been different. So after five pulsating matches in the Malaysian Super League, the Seladangs have collected seven points and are currently 6th in the league table. Not a bad start to the season, but there were several weaknesses that need to be rectified. Defensively, the Seladangs seem to be rock solid, especially with Brazilian defender Rafael Novais marshalling it. He has, arguably, been our best player thus far and deserves all the plaudits coming his way. However, we have been shambolic offensively. Karim Rouani is still nursing an injury while Abdul Hadi Yahya struggled to regain his scoring touch. Failee seems to be inconsistent as well. The Super League will now go on a three-week break, to give space for the national team matches to take place. Azraai Khor needs to use this break wisely, allowing his players to rest and recuperate and to be prepared for tougher matches ahead when the league resumes next month. Perak FA announced its squad for the 2013 Malaysian Super League season during a specially organised event at the Mydin Mall in Meru Raya recently. Team manager Khairul Azwan and head coach, Azraai Khor Abdullah were present along with almost 800 fans jam-packed in the mall. Foreign signings, Rafael Novais and Karim Rouani, were also there. The occasion provided an opportunity for diehard fans to get a glimpse of their idols. All players were present except for S. Chanturu, who was nursing a knee injury and Farizal Marlias, who was given an extended break after his national team duty in the AFF Suzuki Cup 2012. Having drafted several big names, the Seladangs is geared to make a strong impression in 2013, something that PAFA President, Dato’ Zainol Fadzi, felt was possible with a solid home support. The fans’ presence, said Zainol, would inspire the players. The following day the squad of 22 players departed for a series of friendly matches in the Northern region of Malaysia. They trashed Perlis FA 4-0 at the Kangar Stadium. 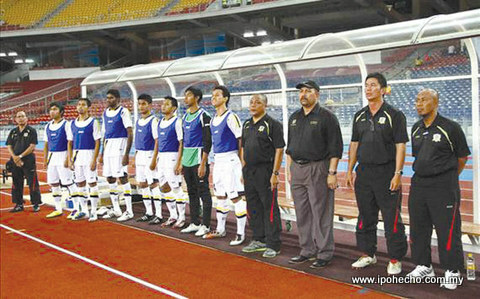 However, head coach Azraai Khor Abdullah wasn’t impressed. “The players need time to gel, especially with the two foreign players, Rafael and Karim. It’s too early to judge anyone. So far, I am happy with what I see,” said Azraai to reporters. There is bad news in store for Perak fans ahead of the start of the new Malaysian Super League season. Football Association of Malaysia requires stadiums to be fitted with 1000 lux floodlights for night play. The Ipoh stadium is fitted with 800 lux floodlights. Perak FA has brokered a deal to upgrade the facility which will begin in January. This means the Seladangs are likely to play their night home matches at the Lumut Naval Base Stadium until March. Farizal Marlias (GK), Khairul Amri (GK), Mohd Jibrail (GK), V. Thirumurugan, Syazwan Roslan, Hisyamuddin, Rafael Novais, Shahrom Kalam, Khairi Kiman, Noor Hazrul, S. Chanturu, M. Sivakumar, Shahrulnizam Mustapha (C), Mohd Nasir, Rafiuddin Roddin, M. Yoganathan, Yong Kuong Yong, Mohd Failee, Azlan Ismail, Hadi Yahya, Karim Rouani. The Seladangs’ initiation to this year’s Super League began with a last minute win over Kuala Terengganu’s T-Team at the Lumut Naval Base Stadium on Tuesday, January 8. It was a scrappy 90-minute affair with both teams playing a cautious game. A header by Rafael Novais was deflected by a T-Team player and the ball went straight into the opponent’s net. Perak emerged as the 2012 President Cup champion for the first time in five years, after overcoming NS Betaria in the final clash at the Perak Stadium recently. After a gruelling campaign that lasted approximately five months, Nurridzuan Abu Hassan’s solitary goal was perfect enough to etch a fitting finale to their successful season. So much had been said about Perak’s younger crop of players prior to the season, with many tipping against their chances of making history. Bigger soccer states like Kelantan and Terengganu were touted as favourites to take the title, but the Young Seladangs worked their guts out to come on top. With Nurridzuan Abu Hassan back in the President Cup squad after a short foray in the senior team last year, Perak had a terrific start to their campaign. Six wins in their first seven matches allowed them to sit comfortably at the top of the Group B table, which included big names like Selangor and Terengganu. Under the tutelage of Abu Bakar Fadzim, the President Cup squad maintained its composure, losing only twice throughout the group stage campaign. It garnered 58 points in the process, as they finished second in the group behind PKNS FC. Nevertheless, it was enough for them to book a quarter final tie against northern rival, Kedah. In the last eight stage, Perak drew first blood by securing a 4-2 victory at home over the Canaries, giving them a much needed two-goal advantage before the return leg in Alor Star. Predictably, the Young Seladangs drew 2-2, thus securing their semi-final spot. Abu Bakar’s men were paired against favourites Terengganu in the semi finals and it proved to be a battle of epic proportions. In the first leg at Kuala Terengganu, both sides came out firing on all cylinders, attempting to seize the early initiative. Both Perak and Terengganu wasted chance after chance and just when the match seemed destined to end scoreless, the Turtles seized a late winner to take home the advantage. Perak’s Young Seladangs were far from done and dusted as they bounced back impeccably to beat them 2-0 in the second leg clash in Ipoh, advancing into the final on a 2-1 aggregate. It was a morale-boosting win that inspired the team heading into the final battle. In what had been a terrific showcase of talent and capabilities from the Under-20 boys, the stage was set for them to make history in their very own fortress. Having said that, skipper Nurridzuan Abu Hassan netted the winning goal to seal a memorable victory over NS Betaria. The path to success was definitely tough, but these youngsters proved their worth for Perak. Over half a season has gone by now, Perak FA has faced plenty of adversities and challenges in this campaign; it doesn’t seem to get easier at all. From inconsistency to complacency and misfiring forwards, the problems seem endless. Nevertheless, with all the international football action hogging the limelight, the Seladangs are in for a respite, for the moment at least. With only eight wins out of their 18 league matches so far, Perak is currently ranked seventh in the league table. Perhaps it’s time we sit back and analyse what went wrong for the Seladangs. This is one significant drawback of the home team. It has failed to produce enthusiasm when on the offensive, which translates into the fact that a mediocre midfielder, in the form of Michal Kubala, is currently leading their goal scoring charts with only 11 strikes. Lazar Popovic was a great disappointment during the first half of the season, failing to score a single goal. Experienced forward, Akhmal Rizal looked jaded as well. A lot of hope was placed on young forward Failee Ghazalee, especially after his impressive outing during Perak’s Malaysia Cup campaign last year. However, the former USM striker sustained a serious injury early on in the season and, in spite of recovery, has failed to regain his form. Fans, however, seem to agree on one fact – Perak players are not on par with their counterparts in the Kelantan and Terengganu teams. Fans want Norizan Bakar’s men to be composed on the pitch and remain consistent in their build-up. Unfortunately, this is the key element that is missing in Perak this year. Its longest winning streak this season was during the early stages of the season, when the players were on a roll with four consecutive wins over Negeri Sembilan, Johor FC, Felda United and Sarawak. Since then, inconsistency has dogged the team all the way. This is a worrying trend for Perak. There have simply been too many occasions this season when opposing teams are allowed to peg the team, despite dominating the matches on the whole. The Seladangs outplayed LionsXII at the Perak Stadium last February. After leading 1-0 scoreline for much of the way, complacency crept in and they ended up losing 2-1. Similarly, Norizan Bakar’s men were expected to steamroll past Sabah at home in April, after beating them a week before. The Sabahans fought hard and secured a 2-2 draw much to the dismay of diehard fans. Team manager, Khairul Azwan appeared to have had the last straw in their wasteful 2-2 draw with Terengganu in May. With only seven games left in the season, there isn’t much Perak can do to save its downward spiral. With LionsXII, Terengganu and Kelantan leading the title charge, the only thing Perak can do right now is to salvage some pride. It’s time to have a good rest, recuperate and go for broke. A good ending to the Super League season would provide a timely boost for the Malaysia Cup campaign later this year. Seladangs Beginning to be Complacent? When Joseph Kalang Tie opened the scoring for Terengganu against Perak, the script was already in the Turtles’ favour. The whole nation is aware of what Terengganu is capable of when on-song thus the outcome of the match was a foregone conclusion. But Rafiuddin Roddin had other plans. He netted the equaliser before Albert Bodjongo scored to give Perak what seemed like an unassailable lead. However, the sting came minutes before full time when Terengganu drew level through Hasmizan Kamaroddin’s goal dealing a blow to Perak’s bid for victory. A distraught Norizan Bakar was left speechless on the sidelines while manager Khairul Azwan Harun looked dejected. Complacency has beset the Seladangs on numerous occasions recently. Since the departure of Steve Darby, Perak tends to show signs of inconsistency, often failing to negotiate their opponents diligently. Perhaps the same issue is plaguing the team this season, if Khairul Azwan’s words are to be digested truthfully. Comparing Perak to more accomplished teams like Kelantan and Terengganu isn’t logical because of the vast quality difference. But those two have set the benchmark for what Malaysian clubs can achieve and should, therefore, be an inspiration for the Seladangs. Kelantan in particular, have been impressive with their grit on the pitch despite having to juggle between local and AFC Cup commitments. Nevertheless, their performance has been equally brilliant in all matches, something that is lacking in Norizan Bakar’s men. Seven wins in 16 league matches is nothing to shout about. The pace of the game is definitely picking up. It’s about time the Seladangs up their tempo and match their rivals, man for man. Football has always been labelled as the beautiful game. But behind that term is pure hard work, diligence, determination and the craving for goals. Norizan Bakar’s men have to show better maneuvering skills on the pitch. They ought to remember that complacency does not ensure success. It only brings misery. Competing against the legacy set by Keita Mandjou and Carlos Caceres must have been a delicate prospect. But every Perak fan rejoiced when Lazar Popovic’s signing was officially announced by the Perak Football Association in January of this year. With Kubala, glimpses of the Krescka-Repasi combination so dominant during the 90s were expected from the Seladangs this year. Perhaps the expectation was too much for Popovic. Yet nobody predicted that early on, with the Serbian proving his goal-scoring credentials during pre-season friendly matches. While Kubala took time to adjust, Popovic showcased his languid style effectively, suggesting that he was going to be a hit in the Malaysian Super League. Perak’s luck with strikers was never dismal. When Frank Seator departed the team in 2004, the fear was that we would not be able to get a capable replacement. In came Keita Mandjou and the rest is history. Similarly, when Keita left, Chilean Carlos Caceres took on the mettle and continued with the legacy. However, it hasn’t been the case with Popovic. Despite his towering presence upfront, the “Serbian Berbatov” failed to impose himself and often had to struggle to overcome the opposition’s defence. Michal Kubala was already proving to be a hit with his near-perfect set-pieces but the same could not be said of Popovic. “We all know that Popovic is a good striker. He just needs time to prove himself,” Kubala enthused when asked about Popo’s hard luck. Perhaps time was just a variable in his situation. Or maybe, Popovic himself was a variable for Perak? Either way, a solitary goal in 15 Super League matches made him a liability for the Seladangs. The April transfer came and the Serbian was shown the door. After weeks of rumours about the possible re-engaging of Keita Mandjou, who currently plays in the Indian League, Popovic’s contract was ended and another unknown forward was snapped up in the form of Albert Bodjongo. Bodjongo’s arrival was kept under wraps, with not much information on him being leaked. However, it is believed that the 23 year-old former Doula Athletic Club striker has an eye for goals, something that Perak side is lacking thus far. So it’s a beginning of a new dawn for the Seladangs. The FA Cup is no longer part of the agenda while Norizan Bakar’s men are too inconsistent in the league. The stage has been set for Albert Bodjongo to shine impeccably and inspire a revival in fortunes. Even though the Super League title is beyond reach, a creditable finish would create some good vibes ahead of the Malaysia Cup campaign in August.